The tail end of winter can feel drab and dreary after the sparkling festivities of Christmas. Your home can, too. 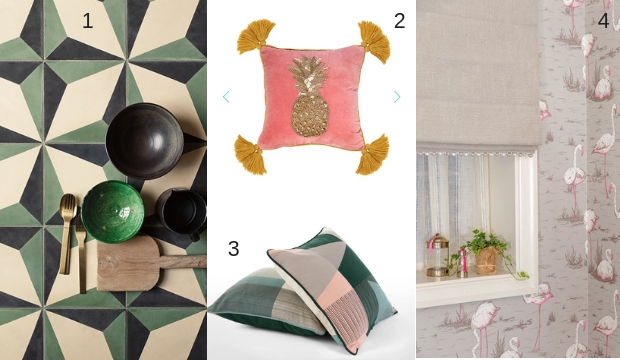 But the New Year rings in a renewed interest in bold, textured patterns and energising, fresh colours that will brighten up home interiors in time for spring. Design industry colour specialists Pantone have declared the 'vibrant yet mellow' Living Coral as 2019's colour of the year. According to Pantone, this striking coral shade, which is softer than red but louder than pink, boasting golden undertones, 'energises and enlivens', and caters to a contemporary need for 'authentic and immersive experiences that enable connection and intimacy'. If painting all four walls of your sitting room in this warm coral hue seems a little daunting, though, opt for a Living Coral colour-pop instead. Invest in coral-coloured cushions, a chaise-longue, or, decorative pieces for the dining table. The muted, pinkish tones of Living Coral superbly compliment the colder greys, steel blues and dark greens often present in maximalist living spaces, such as the living room or bedroom. It's time to invest in a good quality textured or patterned rug. They serve as a room's focal point and help bring its decorative scheme together. Be brave and opt for a geometric pattern in a confident colour palette of rich blues or violets. Although a rich and luscious hand tuffted rug with a dense pile is an indulgent addition to any living space, place it in the bedroom for ultimate luxury. 2019 sees a renewed interest in sustainable living and in natural raw materials such as wood, linen and wool. Look to recycled and up-cycled products that are good for the environment and compliment the contemporary trend for personalisation. We are delighted to see luxury linen sheets and recycled wooden stools, side tables, and desks everywhere, as well as more and more house hold soaps and cleaning materials made from naturally sourced ingredients. Experiment with exotic patterns across interior home accessories, as tropical leaf patterns and organic motifs are here to stay. Expect to see plenty of stars, flamingos, and pineapples on fabrics, wallpapers, encaustic tiles and interiors accessories, too. We are embracing this maximalist interior trend with gusto, so climb aboard. From geometric patterns to monochrome velvet, statement lamp shades are everywhere. And so is vintage lighting. Purchasing one-of-a-kind pieces from vintage markets, vintage stores, online marketplaces and auctions is an easy way to ease yourself into antique light collecting and refresh those faded interiors. The bolder the better in our eyes....here are three statement styles we have fallen in love with.